EU leaders meeting in Brussels are under pressure to give the UN climate talks in Copenhagen a firm signal of their commitment to tackling global warming. The EU sees itself as a world leader in this area, having pledged to cut greenhouse gas emissions by 20% by 2020, compared with 1990 levels. A higher target of 30% has been suggested - but only if similar pledges are made by other industrialised powers. 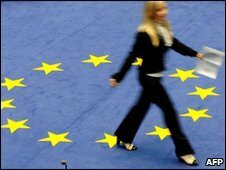 Sweden, chairing its last EU summit, has dismissed speculation that the EU could offer 30% as an incentive to get a really ambitious global deal at Copenhagen. In the current turbulent economic conditions the 30% figure is widely seen as over-optimistic. The environmental group WWF wants the EU leaders to commit to "at least 30%". But in an open letter to Sweden's Prime Minister Fredrik Reinfeldt, the powerful lobby group Business Europe, representing major industrial concerns, urged the EU not to go above 20%. And Poland's EU Affairs Minister, Mikolaj Dowgielewicz, has said the EU must not go above 20% without an "impact assessment". The EU summit conclusions on Friday are unlikely to call for a legally binding agreement in Copenhagen - something that was long touted as a goal but is now looking increasingly remote. Now, the EU is talking about achieving a global climate agreement by mid-2010. It will succeed the Kyoto Protocol, which expires in 2012. But Sweden is reported to be pushing for a target figure that the EU might offer as a boost to the Copenhagen talks. So the discussions over dinner on Thursday are expected to focus on the EU's "fast start" contribution - that is, early funding to help the world's poorest countries adapt to climate change. At their October summit, the EU leaders acknowledged that global financing of about 5-7bn euros (£4.5-6.4bn) annually would be needed in 2010-2013 to launch climate adaptation projects in the developing world. Inevitably Europe's struggle to deal with high unemployment and economic stagnation colours the climate debate. But at least the EU does not have to engage in more haggling over the Lisbon Treaty. 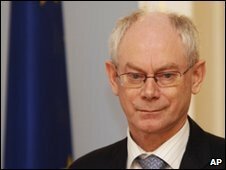 The six-month rotation of states at the helm of the EU will continue, but next year the summits will be chaired by Belgium's Herman Van Rompuy, as the EU's first permanent president. Sweden has invited Mr Van Rompuy to brief the leaders at this summit on his plans for the presidency. His leadership qualities will be under scrutiny, but his appointment suggested that the EU wanted a low-profile consensus-builder rather than a famous "celebrity" politician striding the world stage. The summit will also consider a new strategy for jobs and growth, gradually shifting the emphasis away from crisis management. Yet Europe's public finances are generally weak - many EU states are burdened with huge budget deficits - so talk of "exit strategies" from fiscal stimulus measures still looks premature. Greece's public debt is a particular worry, as fellow eurozone countries, with troubles of their own, are loathe to bail out the Greek economy. Sweden will round off its EU presidency with an agreement on the Stockholm Programme - a blueprint for closer law and justice co-operation in the next five years. It covers areas such as asylum, border controls and policing - but the European Parliament will work on it before it becomes law.